Cellulose insulation has been a tried and true method of insulating homes for decades. It is made from recycled paper with one of the highest percentages of post-consumer waste content of any insulation. It is treated with recognized safe fire retardants. Its excellent sound insulating properties, high R-value per inch, and industry leading environmental properties, make cellulose insulation a perfect choice for insulating attics and sidewalls. It is an excellent choice for adding insulation in walls of older existing homes due to the ease of installation. Fiberglass insulation is made from molten glass that is spun or blown into fibers. The recycled content of fiberglass insulation ranges from 0-40%, but that includes waste generated during manufacturing. Its most common forms are rolls and batts, which are used in wall cavities and attics and also in a loose-fill form that is blown-in. Fiberglass is non-combustible, but it will melt in a fire, potentially allowing that fire to spread. Care should be taken when installing fiberglass to wear protective clothing and a respirator, per the manufacturer’s guidelines, to avoid direct contact with, or inhaling of, the glass fibers. Spray foam insulations are petroleum-based products and typically have little or no recycled content. They require professional installation, using special equipment to measure, mix, and spray the foam. Due to their ability to help reduce air leaks, they are often used in selected areas where the reduction of air leaks is critical, although it can be used throughout a structure. 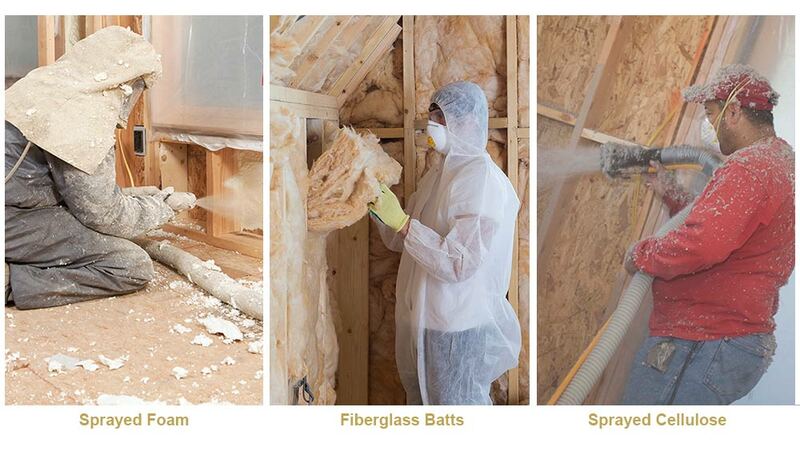 The cost to insulate using spray foam is typically significantly higher than other materials. Excess sprayed foam insulation from the job site, which is typically 20% or more, cannot be reused or recycled. Another high recycled and more unusual product is recycled denim insulation. The insulation is primarily made with pre-consumer recycled cotton or denim waste collected from factories manufacturing jeans and other denim products. There are now some with programs targeting post-consumer recycling of jeans and other denim products. This product is environmentally friendly as it is made from a rapidly renewable resource. Performance is similar to other insulation batt products. It is easier to install than fiberglass since it does not contain the glass fibers. The cost to insulate with cotton/denim is typically significantly higher than other materials and the product is not as readily available to consumers in many areas. Learn more about the key performance features for these most common types of insulation products here on the CIMA website.